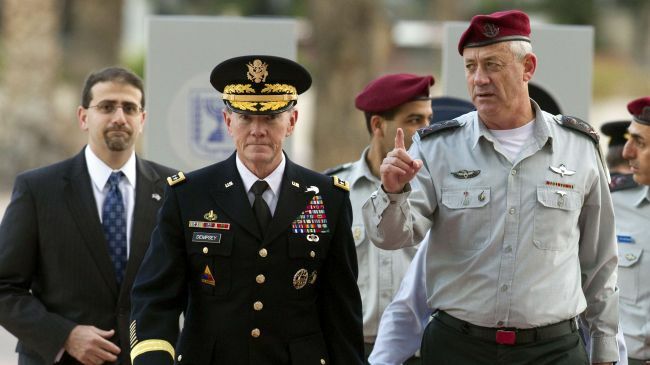 Israel’s Chief of Staff Lieutenant Benny Gantz (R) and his US counterpart Martin Dempsey (C) arrive at a ceremony at the Rabin military base in Tel Aviv, January 20, 2012. The Chairman of the Joint Chiefs of Staff of the US Armed Forces, General Martin E. Dempsey, has given the “Legion of Merit” award to his Israeli counterpart, Benny Gantz. The award was given to Gantz on behalf of US President Barack Obama, during a ceremony at the Pentagon, for what Washington called an outstanding and noteworthy command. During the ceremony, the Israeli military chief praised the cooperation between Israeli and US militaries. The US award and praise for the Israeli army chief comes a week after an Israeli airstrike on a Syrian research center in Damascus, which left several people killed and injured. The Israeli official who is in Washington for a five-day visit held “a series of work meetings” with his American counterpart and other American officials. The Syrian army said on January 30 that two people were killed and five others injured in an Israeli airstrike on a research center in Jamraya, near the capital, Damascus. The violent attack drew international condemnation, from countries including Iran, Turkey, as well as the Organization of Islamic Cooperation denouncing the move as a violation of international law. The United States remains the biggest contributor of military aid to Israel, amounting to three billion dollars per year. Why? Are you angry the head of Hezbollah didn’t get it?